Please check back at a later time to find more information about event tickets. The event program is still under discussion with FISA. We shall publish the provisional program as soon as possible. All events have heats or races for lanes on Friday. Events with repechages and semifinals will have repechages Friday afternoon. All quarterfinals are programmed for Saturday morning. All semifinals are programmed for Saturday afternoon, followed by the repechages of events without Semi-finals. Non-Olympic events have their finals on Saturday afternoon. Sunday is reserved for all Olympic and Paralympic A- and B-finals. This World Rowing Cup will host University Eights and Quadruple Sculls as well. Their timing is still under discussion. Our volunteers will guide you to the closest parking lot upon your arrival. To reach the venue using public transport, please travel to “Rotterdam Alexander” station. You can use the website of the Dutch Railways to plan your trip. 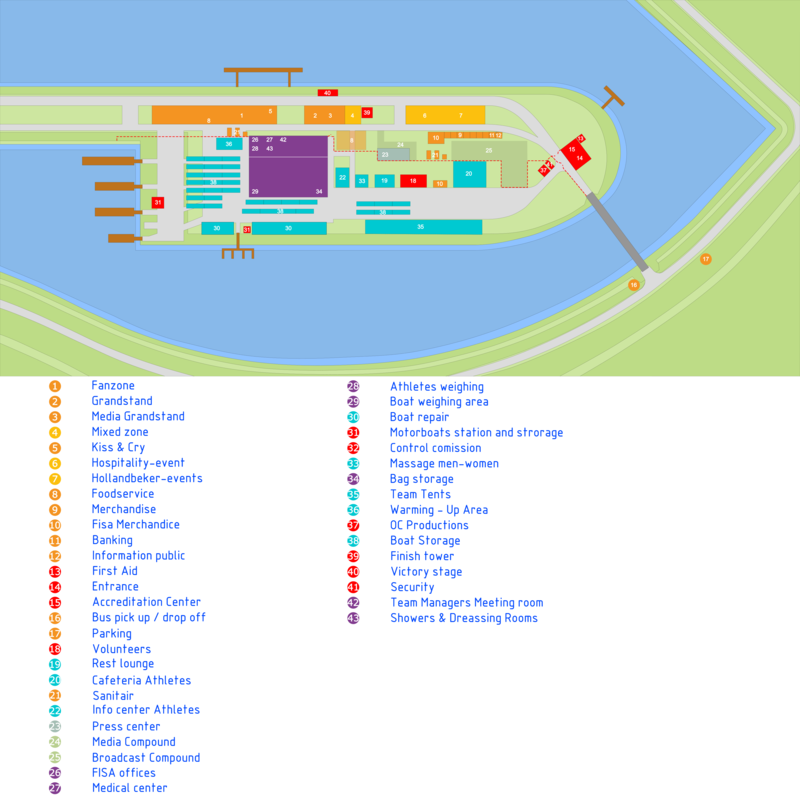 We have arranged designated buses to drive between Rotterdam Alexander and the regatta venue. We will publish the time table for these buses on this page as soon as possible. The following image shows a map of nearby roads and cities. We would like to notify you that during the World Rowing Cup there will be two other large events in the Rotterdam region, being the North Sea Jazz festival and the World Port Baseball Tournament. This will put some stress on the availability of accommodation. Our accommodations partner ATPI has been able to block sufficient hotel capacity for the World Rowing Cup needs. However, we strongly recommend liaising with them to make your required reservations before October. Our ATPI booking team is managed by Barbara van de Rest, and you can reach them on rowing.netherlands@atpi.com or by phone at +31 (0)20-2011215.